I asked a few of my colleagues in the math office about any the reservations they had about having their students make class presentations. "I think I'm always disappointed with the end product." "You do it for too long, and they get bored. They don't listen to each other." "I worry that so many kids are off task and not engaged when the other students are presenting." When I asked one of them how many days they usually allocate to project completion IN CLASS, her response was, "Days?! How about weeks! If you don't give more time, even those honors kids won't do as well because they're so stressed out about their other classes." Needless to say, taking out time for project presentations is not something we usually get warm fuzzies about. At the end of every chapter in AP Stats, I usually alternate between summative exams and summative projects. The exams are good because they get more practice preparing for the AP exam, but I think the learning is usually more evident (or lack thereof), and more authentic. We usually write papers to practice formal, technical writing and integrating math with charts and text, but I was excited about using the Touchcast app recently for my flipped lessons in another class, so I thought I'd have my students kick the tires. The students had a choice between two projects requiring similar skills, "A Fair Coin," or "Airline Overbooking." The most I usually commit to these projects is one day to allow for questions and clarifications, but there was an obvious need for more support on this project (especially because students under-performed last year), so gave a day for stats work and a day for putting together the slides. 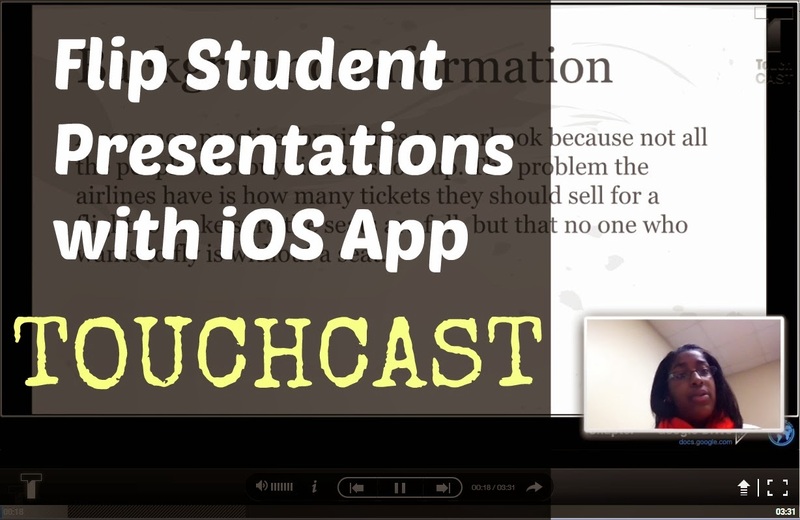 After the slideshow was together, students copied the share link and inserted it as an interactive app in the iOS broadcasting app, Touchcast. Students were really nervous about being on camera and talking about their slideshows. In a good way, I think. I enjoyed the creative tweaks many of them inserted in their presentation, risks that I think they may have been less likely to take if they were up in front of the room. (even though they knew I would be sharing their videos). Getting in Touchcast took about a day and a half, but it was time we would have taken any to present, and using Touchcast, everyone was ON TASK because they were making their videos at the same time.